“What is your approach to culture change?” we are often asked when clients are first getting to know us. It’s always tempting to pull out a PowerPoint presentation and go through our 12-Step Program for Culture Change, deadpan. But we never do. We don’t have one. If only it were that easy. When you get down to the bottom of it, what people are asking is “How will you get us to change how we behave?” We don’t. We really don’t. We can’t change people, only create opportunities for people to learn by trying to make things better. One of the ways we do this is kaizen. It would be easy if we could pass out our Kaizen Philosophy cards and make everyone card-carrying members of the Kaizen Culture. But adults learn best not when they hear or see but when they do. Adults stay interested in what they are doing when it’s something that they care about, or that makes their life better. Kaizen activity is done in a lot of different ways, and the week-long kaizen event is just one of them. The kaizen event (or Accelerated Improvement Workshops, or Rapid Improvement Events, or equivalent) is characterized by being a team-based workshop focused on making practical improvements in a short time. Kaizen events change things, but more importantly change culture by helping people change. 1. Working in cross functional teams promotes not only opportunities for better communication but also the chance to see internal customer-supplier relationships. The goal is for people to see the bigger picture and optimize the flow of work across the entire process rather than individual operations. These cross functional teams often include customers and suppliers from outside the company. Involving non-experts from outside of the area being kaizened can also open up the discussion as the newcomers need to have some of the basics of the process explained to them, often exposing long-held assumptions. Having a cross-functional team avoids group think as people can offer fresh perspectives on issues. 2. Going to see what’s actually happening can be the difference between a successful kaizen and one that’s not so. One of the things we like to ask prior to a planned kaizen is “will we be able to observe the actual process?” since without going to see what’s actually happening, the risk is that it’s all so much talk. The “go see” behavior can be a challenge when doing kaizen where the process is less visible, such as projects or in some office processes, but critical all the same. 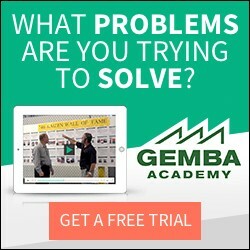 The discipline of spending time on the gemba collecting the facts and verifying the current condition is a characteristic of a kaizen culture that kaizen events help teach. 3. Testing ideas out right now leads to a culture of experimentation where trial and error in rapid cycle helps everything from innovation to decision making to simple process changes easier. If it’s ok to try, it’s ok to fail as well, provided you learn from it and keep trying. One of the goals of a kaizen event is to make enough improvements during the week so that by Friday you have a new process that is stable enough to be documented with Standard Work. This enables people to see that significant change can happen in less time than it takes to debate it. So if you’re using kaizen events primarily to drive business results in the short term, you may want to consider using kaizen events to demonstrate a new way of thinking and doing business so that culture change can deliver long-term business results for you also. I hope it was truly nothing earth shattering and you are able to share a little more context. Some of my employees said “he can’t leave us hanging – not his dedicated readers of the blog!” We usually use your material for short meetings and this week it was brought to our attention “Learning lessons….,” as people trying to learn humility, can you provide a little more detail to relate and learn. Any more would be great. I’m afraid I’ll have to keep you in suspense regarding the “big mistake”. The best mistakes to learn from are your own, in any case. Sorry I can’t be of more help. Why do you have to rely on “events” to drive kaizen? You can incorporate lean thinking, improvements, and change into daily activities. At Toyota you will see suggestion systems, QC Circles and project-type kaizen activity being far more prevalent than jishuken or kaizen events. In a mature Lean organization such as Toyota you will not need culture change as much as at an organization that is far more traditional. Kaizen events happen to be very helpful with culture change by bringing people together, going to gemba and getting a lot done quickly. I would like to know what are the 12-step program for Culture Change and how can I read about them?? We do not have a 12-step program for culture change. The three points listed above are a good start, but not the total picture. Yours is a good question. I will think on it and possibly post something in the future.